Tropical depression 9E has gained banding and will likely be upgraded to tropical storm strength soon. The gustiest winds will remain offshore, but some heavy rainbands will likely affect the coast with brief gusty winds. 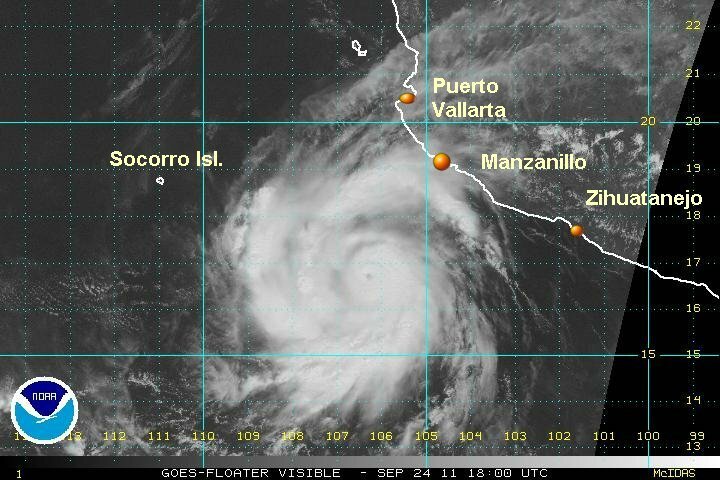 As of 5 am edt / 2 am pdt 9E was centered near 13.4 N / 96.5 W or about 170 miles sse of Puerto Esondido, Mexicoi. Movement is wnw at about 5 mph. Top sustained winds are estimated at 340 (NHC 35 mph earlier advisory). Pressure 1006 mb. Forecasts take 9E northwest paralleling the coast about 100-200 miles offshore of Mexico over the next several days. 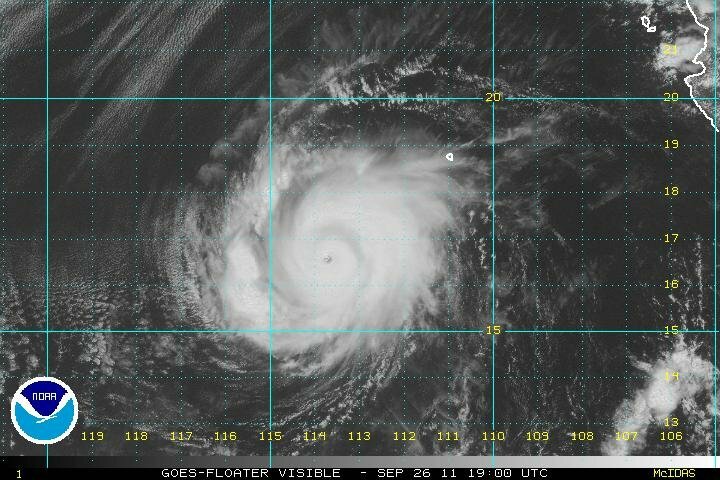 I believe that Hilary is now a hurricane as an eye is forming on the IR satellite imagery. It's interesting to note that not only is there a circular mass of clouds will Hilary, but also to the northwest almost like a seperate entity. Hilary is in a favorable area for strengthening and may undergo a rapid deepening Friday or Saturday. The strongest winds will remain offshore, but some gusts can be expected with rainbands on the coast. Seas are predicted at 15 feet near the low center, but should climb much higher as Hilary strengthens. 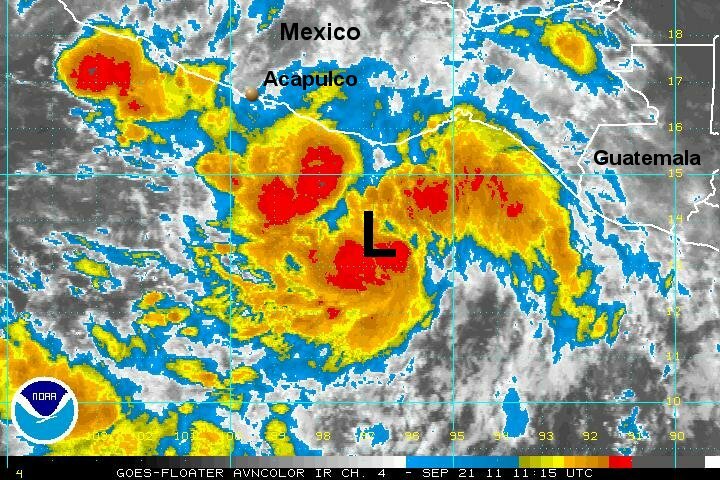 As of 7 am edt / 2 am pdt Hilary was centered near 15.0 N / 98.4 W or about 150 sse of Acapulco, Mexico. Movement is wnw at about 10 mph. Top sustained winds are estimated at 75 mph (NHC 70 mph 5 am edt advisory). Pressure estimated at 987 mb. Forecasts take Hilary northwest paralleling the coast about 100-200 miles offshore of Mexico over the next several days. It will recurve northwest out to sea well southwest of Cabo San Lucas Monday and Tuesday. Hilary has entered a rapid deepening phase. My estimate of wind and pressure is considerably more than the hurricane center's as Hilary is strengthening quickly. Hilary is also a little closer to the coast then previously expected - now just 75 miles offshore. 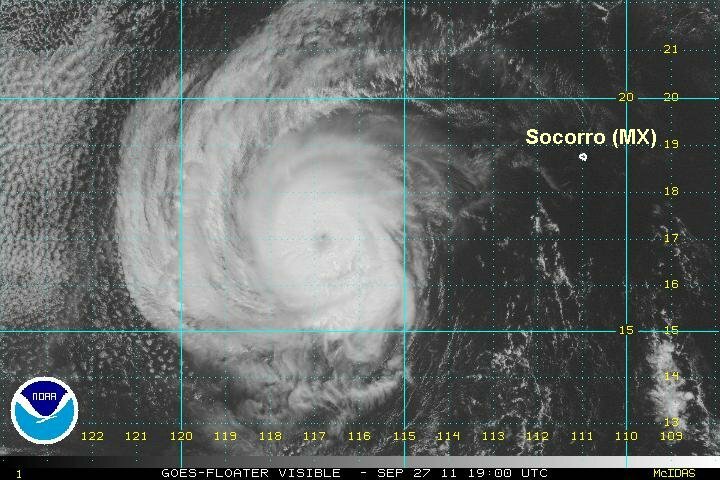 Hilary is very small in size with the CDO or circular overcast near the eye only 100 miles wide. A small system can strengthen very quickly. Residents on the west central coast should pay close attention to the track. 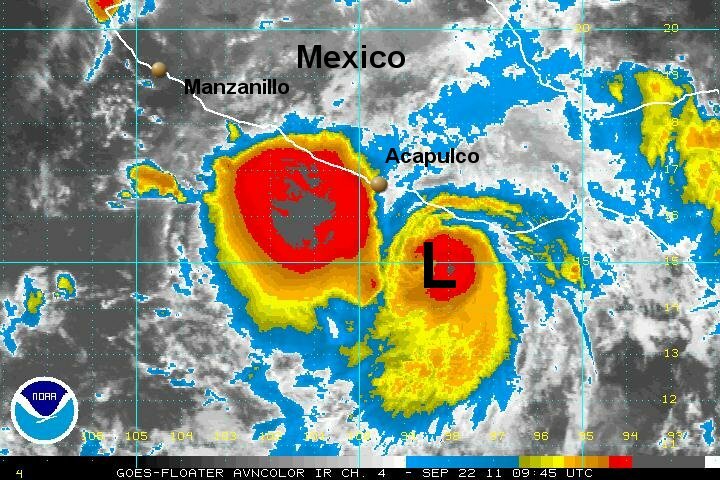 As of 4 pm edt / 1 pm pdt Hilary was centered near 15.7 N / 99.7 W or about 75 miles south of Acapulco, Mexico / 395 miles southwest of Manzanillo, Mexico. Movement is nw at about 10 mph. Top sustained winds are estimated at 100 mph (NHC 85 mph 2 pm edt advisory). Pressure estimated at 970 mb. Forecasts take Hilary northwest paralleling the coast about 50-100 miles offshore of Mexico over the next few days. It will recurve northwest out to sea well southwest of Cabo San Lucas Monday and Tuesday. Hilary is almost a cat 5 hurricane. It has a perfect eye appearance and thankfully has moved farther west than than what was anticipated. At this time Hilary is moving due west with a recent wobble to the wsw. This is typical of a very strong hurricane to see wobble in its track. NOAA estimates seas up to 24 feet near the center, but I wouldn't be surprised at all to see higher seas. Hilary is a small hurricane and that will limit the size of the waves due to the small wind field. Cruisers will probably be fine over this weekend as Hilary will be moving farther out to sea and slowly weakening. 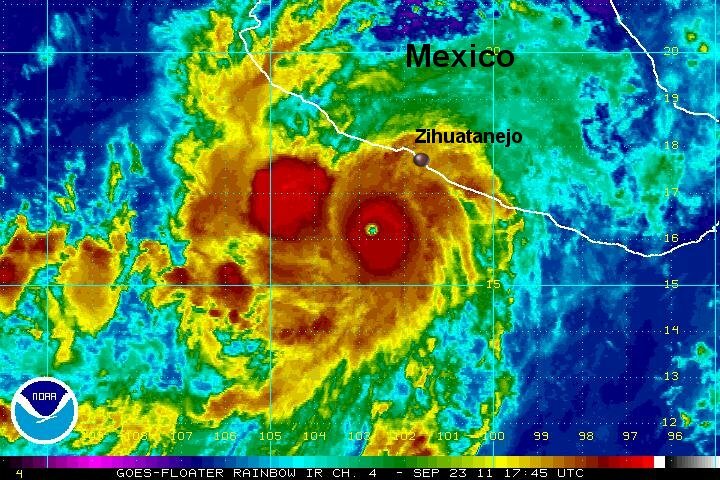 As of 7 am edt / 4 am pdt Hilary was centered near 16.0 N / 102.1 W or about 130 miles south of Zihautanejo, Mexico. Movement is west at about 9 mph. Top sustained winds are estimated at 155 mph (NHC 145 mph 5 am edt advisory). Pressure estimated at 935 mb. Forecasts take Hilary west farther out to sea today about 125-200 miles offshore of Mexico into Saturday. It will recurve northwest out to sea well southwest of Cabo San Lucas Monday and Tuesday. Hilary is still a powerful, but small cat 4 hurricane. It continues to move away from the coast. Effects on the coast will mainly be large swell, heavy rainbands with brief gusty winds. I have dropped my winds to now match the hurricane center's estimate since cloud tops in the eyewall appear to have warmed slightly. Cruisers will probably be fine over this weekend as Hilary will be moving farther out to sea and slowly weakening. Take the Dramamine. 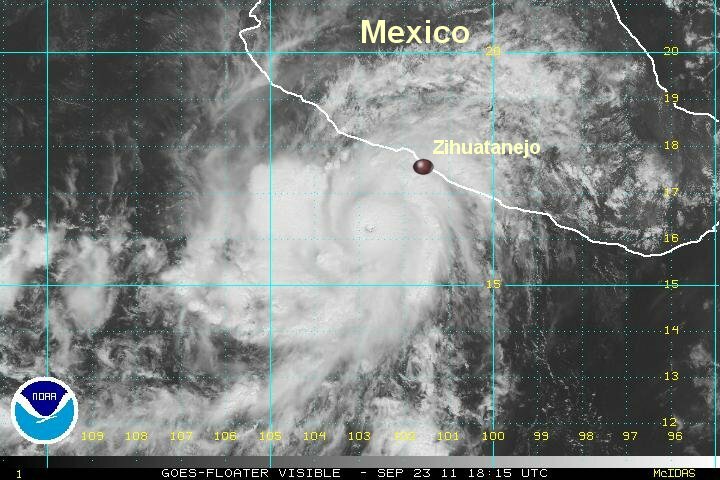 As of 3 pm edt / 12 pm pdt Hilary was centered near 16.4 N / 102.9 W or about 125 miles southwest of Zihautanejo, Mexico. Movement is west northwest at about 9 mph. Top sustained winds are estimated at 145 mph (NHC 145 mph 11 am edt advisory). Pressure estimated at 940 mb. Forecasts take Hilary west northwest away from Mexico. A trough may pull it northward well west of Cabo San Lucas early next week as it weakens. Hilary has changed little overnight in strength. Possibly slight weakening as the cloud tops have warmed a touch. Some heavy rainbands are on the coast near Puerto Vallarta to about Manzanillo. The strong winds are not a threat to the coast. 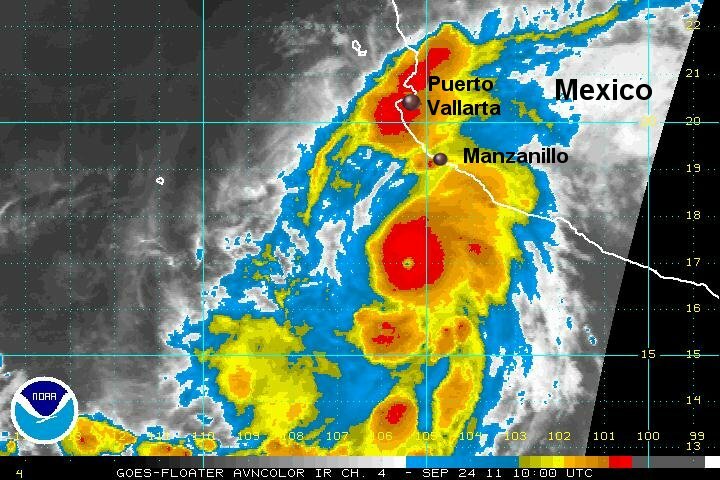 As of 7 am edt / 4 am pdt Hilary was centered near 17.1 N / 105.3 W or about 155 miles south southwest of Manzanillo, Mexico. Movement is west northwest at about 10 mph. Top sustained winds are estimated at 140 mph (NHC 140 mph earlier advisory). Pressure estimated at 940 mb. Hilary has continued away from the coast of Mexico today. The only effects are larger than normal swell and an occasional shower or storm. Overall, no appreciable change in strength has been noted. Hilary may affect parts of the Baja several days from now. 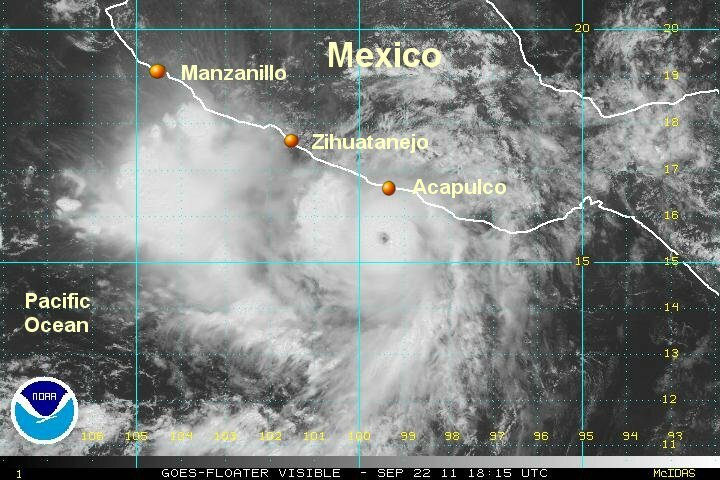 As of 4 pm edt / 1 pm pdt Hilary was centered near 16.9 N / 106.5 W or about 200 miles southwest of Manzanillo, Mexico. Movement is northwest at about 10 mph. Top sustained winds are estimated at 140 mph (NHC 140 mph earlier advisory). Pressure estimated at 940 mb. Forecasts take Hilary west northwest away from Mexico. A trough will pull it northward well west of Cabo San Lucas early next week as it weakens. Some models drift a weakened Hilary toward the middle part of the western Baja by the middle of the week. Hilary Has slowly started to weaken as it makes its way over progressively cooler water. It is still a small, but powerful cat 3 hurricane. The effects from Hilary other than larger than normal swell have pulled away from the coast. As of 9 am edt / 6 am pdt Hilary was centered near 17.3 N / 109.0 W or about 400 miles sse of Cabo San Lucas, Mexico. Movement is wnw at about 10 mph. Top sustained winds are estimated at 120 mph (NHC 125 mph earlier advisory). Pressure estimated at 953 mb. Forecasts take Hilary west northwest away from Mexico. A trough will pull it northward well west of Cabo San Lucas early this week as it weakens. Some models drift a weakened Hilary toward the middle part of the western Baja by late in the week possibly as a tropical storm. Hilary is wobbling westward with some strengthening shown on the satellite imagery. The eye is still distinct and cloud tops cold over the eyewall indicating a strong hurricane. The eyewall has also expanded over the past six hours. It continues to moves farther away from Mexico. As of 5 pm edt / 2 pm pdt Hilary was centered near 16.6 N / 114.0 W or about 510 miles ssw of Cabo San Lucas, Mexico. Movement is west at about 10 mph. Top sustained winds are estimated at 135 mph (NHC 135 mph earlier advisory). Pressure estimated at 949 mb. Forecasts take Hilary west away from Mexico. A trough will pull it northward well west of Cabo San Lucas during the next 24-36 hours as it slowly weakens. Forecast models take Hilary slowly north - well west of the Baja as it weakens this week. Hilary has started to turn over the past few hours. A noticable change from west to nw motion has occured. Hilary's brief strengthening phase from last evening is now over too. Hilary is moving over cooler water and will drop below major hurricane strength within the next 12 hours. 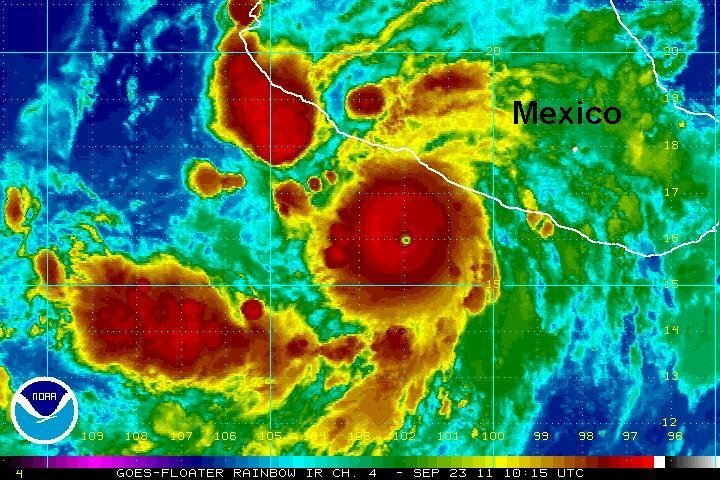 As of 7 am edt / 4 am pdt Hilary was centered near 16.9 N / 115.8 W or about 585 miles sw of Cabo San Lucas, Mexico. Movement is northwest at about 12 mph. Top sustained winds are estimated at 115 mph (NHC 115 mph earlier advisory). Pressure estimated at 961 mb. Forecasts take Hilary nw, then northward well west of the Baja as it weakens the next several days. 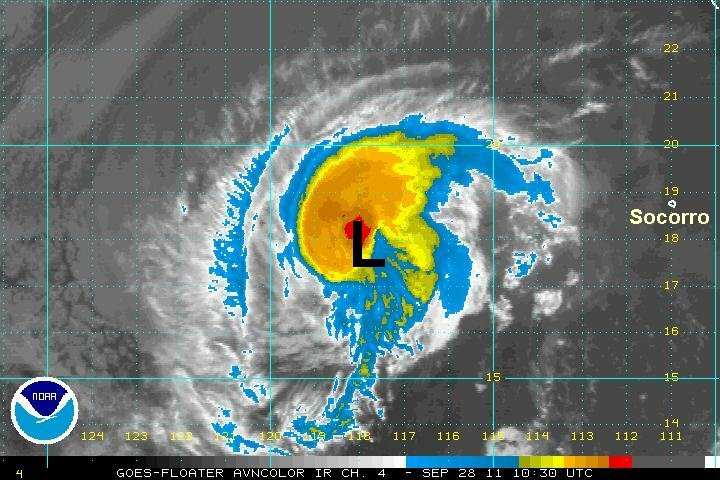 Hilary is moving wnw as it is slowly turning today. By tomorrow it should be moving northwest or nnw. Colder water is in the pathway of Hilary so continued weakening is expected. As of 4 pm edt / 1 pm pdt Hilary was centered near 17.1 N / 116.8 W or about 600 miles sw of Cabo San Lucas, Mexico. Movement is wnw at about 12 mph. Top sustained winds are estimated at 105 mph (NHC 115 mph earlier advisory). Pressure estimated at 961 mb. Hilary is moving gradually over colder water and will continue to lose energy. Hilary appears to be a minimal hurricane and should be downgraded to a tropical storm by tonight. It will likely hang on as a depression for a few more days after that. Hilary is not a threat to land and its effects will remain offshore. As of 7 am edt / 4am pdt Hilary was centered near 17.8 N / 118.2 W or about 650 miles wsw of Cabo San Lucas, Mexico. Movement is nw at about 12 mph. Top sustained winds are estimated at 75 mph (NHC 90 mph earlier advisory). Pressure estimated at 975 mb. Forecasts take Hilary nw, then northward well west of the Baja as it weakens over the next several days. This will be the last update on Hilary.